Our 1 Row Planting Unit is sold in a complete package ready to go to the field and includes one of our TP46 planters mounted on a cultivator with five rigid shanks. The planting unit matches the lasting quality of Covington's line of planters, for garden and multi-purpose single row planting. Shown with a polyethylene fertilizer hopper. 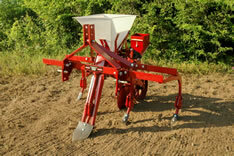 The unit is also available with a wood fertilizer hopper.